Wig is still looking great. I washed it and the hair is still sleek and shiny!! The color has not faded yet. I am very happy with the hold up. I wear it a few times a month. No knotting problems!!! I spend a lot of my free time thinking about sheitels. Why? Because sometimes I have to wear one on my head. (and I blog about them) When I contemplate why I wear a sheitel, and take away the religious reason for doing it, I realize I do it to have good hair. 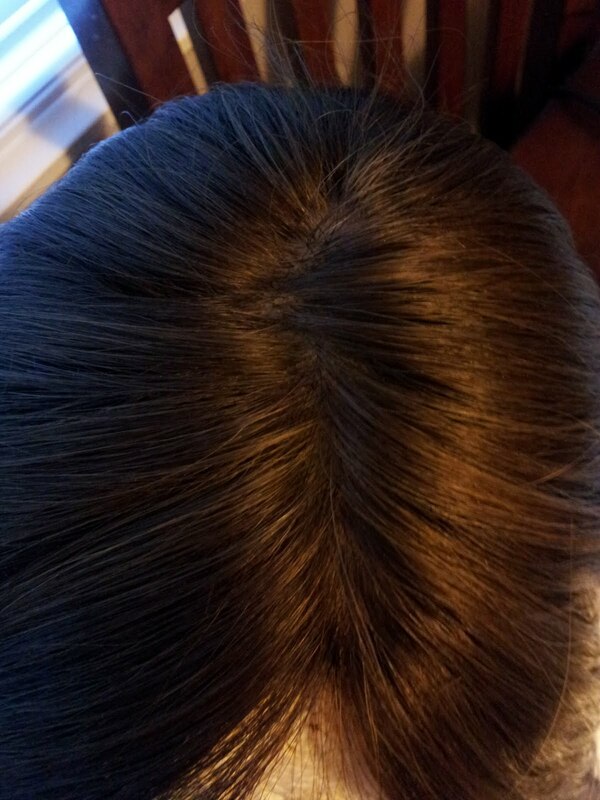 But I digress, this is a review of a Milano Collection Wigs Ponytail Wig. Originally (when I was first married) I wanted a sheitel that looked exactly like my own hair. After years of searching and never finding "my hair" I gave up. Instead I decided to buy wigs that look good and to purchase hair that is fashionable and beautiful. For example, right now it seems that everyone wants perfectly straight sleek hair for everyday management, and I bought a wig with the perfect "Keratin-treated", hair that looks as if I stepped out of a salon or was genetically blessed. Why is the wig such a pretty shade of light brown? Because the wig is made of dyed hair. and this last question is the DOWNFALL of processed wigs. Because they are so beautiful when new in the salon, yet their life span can be so short. Why? Well this wig is made of processed Asian hair (possibly processed low quality European). Asian hair typically doens't grow in 10/6/8 color... so it was originally 1B, 2 or 4 and then it was dyed. Then it was straightened for uniformity. So this hair has gone through a lot. 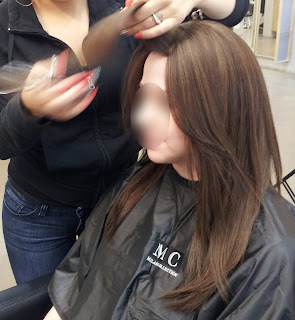 Therefore it will dry out and oxidize faster than wigs that have undergone less processing. Ponytail wigs differ from normal wigs in a few ways. 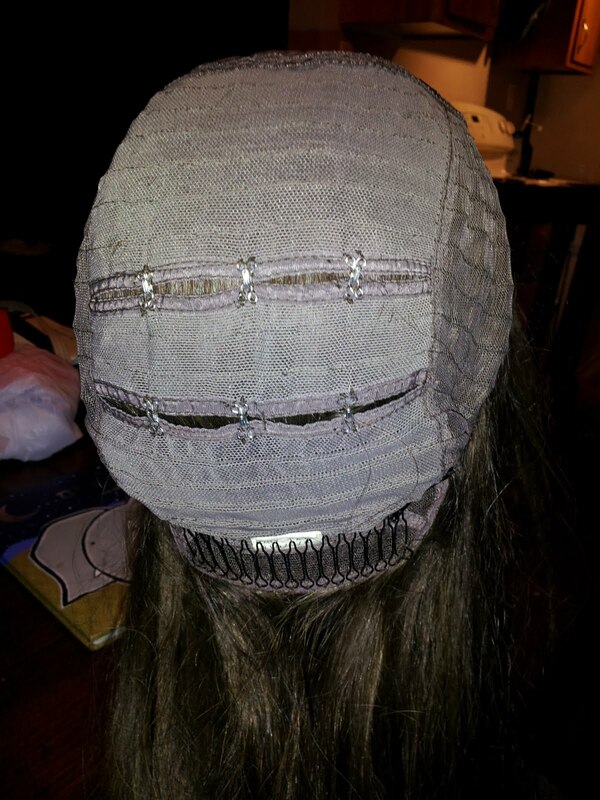 The bottom few wefts near the nape of the neck are sewn upwards since its intended to be styled in a ponytail. Secondly, they typically are made with less hair so they have a thinner appearance and look less bulky around the cap area when the hair is pulled back. Third, many companies use lower quality hair on their pony wigs because... they can - the sheitel is styled with the hair pulled back. So typically there is no need for the wig to be made of the most gorgeous hair or to have the most natural looking wave pattern in the world. I bought this wig at the Milano Collection LA Showroom during their Pesach sale. This wig was considered a "pre-cut" so it only qualified for the $50 discount. Since I have a large head, most wigs do not fit me right, but this was a XL cap and it covers all of my hair. 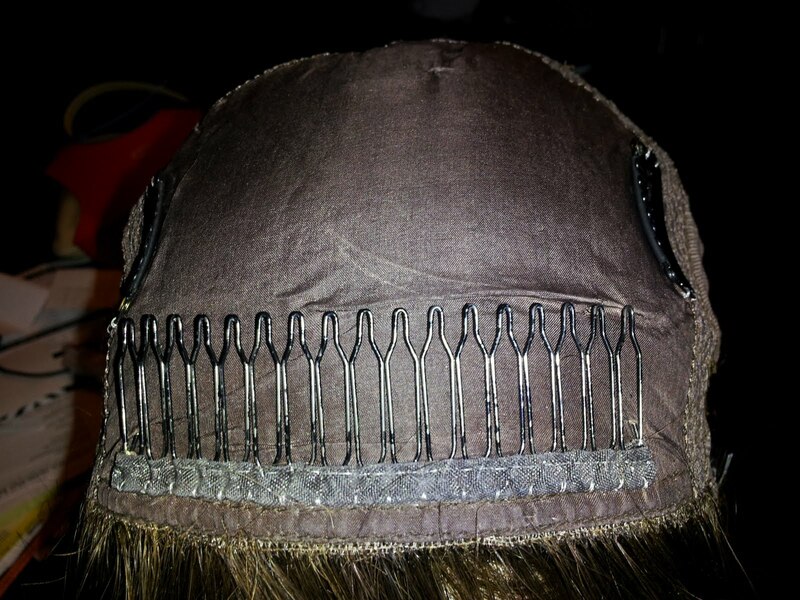 Pony wigs have more clips and combs than a regular sheitel. There is a comb near the forehead, and one near the nape, and 2 clips near the forehead and 2 near the nape. Additionally there are two clips that can attach the wig to the top of your head, but I have not used these yet. I have no doubt that this wig is extremely processed. 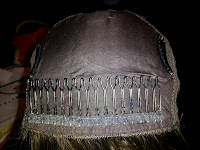 When I walked into shul wearing it, one of my single friends, who has had every hair straightening treatment done under the sun, immediately started debating whether she thought my wig had been Thermal Reconditioned (Japanese Straightening) or had the Keratin Treatment (Brazillian Blowout) done while feeling and examining the wig up close. It is clearly stick straight and does not have much body to it. However, it is the kind of perfectly straight hair that everyone who does all of these straightening treatments on their hair wants. No frizz, just perfectly straight smooth hair. In fact, I almost feel guilty attending mommy/baby classes in this sheitel because it looks as if I spent hours blow-drying and flat ironing my hair, and I wonder if the moms think that I have time to do that. I find the sheitel very comfortable because it is large enough and because it is lighter than a regular sheitel that would have thicker hair and more wefts of hair overall. I wear this sheitel in a pony and also down. I think it looks really good down, its just perfectly sleek and straight. 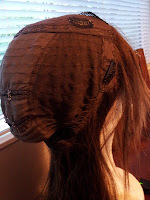 When wearing half up you have to be careful because of the thinness it could be possible to see the wig cap if you have the top layer in a certain configuration. Although the bottom wefts are sewn up and I can feel them going outward when I touch the back of my head, but the naked eye cannot detect this. I have a friend with a Milano pony who wears her wig down all the time and its (the bottom wefts being sewn upward) never been an issue for her. So far the wig has not been knotty at all. The wig cap has a feature that you can actually open 3 hooks to create a hole in it, which allows for someone to pass their own hair through, if they wanted to blend it into the pony, or if you want make a little more room in the cap. I think this color really brings out my blue eyes and I think I can wear a larger range of colors and brighter colors when I am wearing this hair color. However, the downside to the color of this sheitel is that my other wigs are closer to the 16/10 or 12/8 range, and look notably different. Also, I wore this once on a Wednesday and now I have to wear it every Wednesday (or a hat/scarf) so my clients do not notice that my hair suddenly changed colors, textures and lengths. I want to keep readers posted on this sheitel as time goes by. I bought it Pesach 2012 so its about a month old now, and I haven't washed it yet because I wear it about 2x a week. I think that the less I wash it, the longer it will last. When I do wash it, I'm going to be extremely gentle and use high-quality salon shampoo intended for treated hair, ideally sulfate free. On a side note, since I only needed a bang trim, I only had to pay $25-35 for the cut at the Milano Showroom in LA, which was a big plus for me. I plan on doing follow up reviews on this wig as it ages. milano sheitels are a great bang for your buck! I have to say.....I've been working with sheitals for years, including milanos and know A Lot about them. They never ever use Asian hair, now it's true that their pony wigs are treated (usually by coloring) but that is one of the main reasons why they are so inexpensive, they are still European human hair and pretty long at that, true they will not last as long as their main virgin line, but for 600 bux who cares? To say that they will only last a year would be if a person is completely mistreating It which I have seen, but if someone is taking proper care of it then there is mo reason why they shouldn't get a few goo years out of it. European is not synonymous with "top of the line hair". There are high, mid and low range hair qualities in hair from all origins whether it is Asian, European, South American, Indian etc. That being said, Milano clearly states that it sells two tiers of hair quality and their prices reflect that. To me, "European" can easily be tossed around because Europe isn't a real continent anyway. Have you ever noticed that Asia and Europe are connected? They are separated by a mountain range, not an ocean, so European can mean very different things to different people. I guess my point is, just because something is European doesn't mean that it is the highest quality available on the market. I have felt better sheitels in my life and like I said in my post I will give this wig the benefit of the doubt and hope that it will last many years to come. I have my Milano pony shaitel for a year and a half. It's stunning. I went a shade darker as the saledwoman told me that it will oxidize. It is now a perfect color. I own 2 shevy's,a Fortune and a Shuly besides for this. The Milano is my favorite by far!